The fateful day is here, and how! You have invested in everything under the sun; bassinet, changing table, diapers, and the cutest of clothes for your bundle of joy. Let’s however, not forget the meal times, the spitting, teething, and of course, the reflux. We have to admit that most children eat less and smear more. Therefore, the one thing that you’ll need even more than towels and blankets to keep your child neat and clean is bibs. Now since there is no shortage in the market for bibs of all sizes, colors and textures, choosing good quality ones can be a challenging task. Embracing parenthood is of course all about making the best choice you can. Since you may already be burdened with a lot of different options, relax and check out eight of our picks of the best baby bibs. You can thank us later for bringing you the best and most cost-effective bibs for your precious little one! Our very first pick for a good quality bib is food grade, stain and smear resistant and best of all, quick dry! Silicone is quite the rage among parents mostly because it’s travel-friendly and easy to clean. These bibs can be used as more than just feeding bibs and come in a lot of colors, and are usually packed two in a set. The beauty of these silicone-made bibs is that they last really long. For parents who like trendy and hassle-free products, the silicone bib can prove to be quite the accessory for your young one. Since let’s face it, cleaning poor quality cotton or bibs made of wrong fabric can be a painful process with less than desired results. Also, low-quality products prove to be detrimental for your child’s skin and can cause rashes. Durable and can be used for children of all ages. Progressive design that includes a pocket that stays open. Thorough cleaning required or can discolor and even form mold. The holes are prone to rip if stretched too much. These bibs are a perfect combination of functionality, trend and comfort. Call it baby drool bibs or the bibs that firmly adjust; Velcro is the word. Though suitable for all ages, Velcro SuperBibs is our pick for the youngest of munchkins who drool, eat, and are fussy about food. Stylish, printed and easy to use, these bibs come with a Velcro strap that is easy to fit and adjust according to the snugness you require. These bibs also happen to be machine washable and are odor resistant. Waterproof and easy to clean, these single layer bibs come in fun shades that can make your child look cute as a button. They are most suitable for ages between 6-24 months. User-friendly pockets to catch food and spillage. Velcro strap bibs that lay flat. Made with polyester, easy to remove and wash.
Straps can take time to dry so investing in more than one is sensible. Unless carefully folded, the straps can snag onto other items in the laundry. 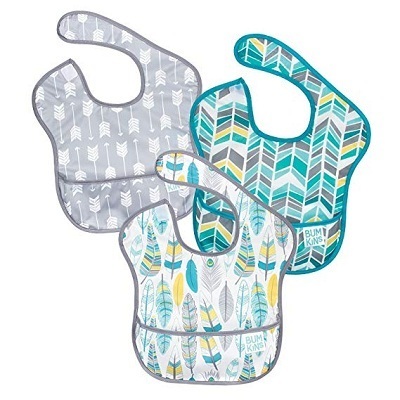 These bibs are easy to wash, easy to store and convenient to use. This category is for the slightly older kids who are teething and hence drool a lot. 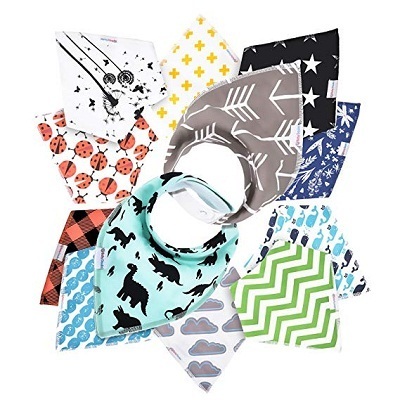 Our pick for the best bandana bibs are not only super user-friendly and cost-effective but also happen to be an excellent idea for a baby gift. Cotton-made, absorbent, and hundred per cent organic; these bibs are stylish and easy to wash. These vibrant and cute bibs also happen to be hypoallergenic. They are packed well in a storage bag that can also be used for other purposes. The layering that makes the bib will ensure that nothing permeates onto your little one’s clothes or toys. Comes 12 in a pack that decreases laundry for you. Even with multiple washes, the bibs stay intact. Waterproof and comes in a variety of shades to up your little one’s style quotient. Tends to ride up a bit. May not be suitable for tiny babies as these bibs are big. These bibs are a blend of quantity and excellent quality that will last. Our pick for best bibs for newborns – explore the world of super-absorbent, reversible-necked, padded bibs as soon as your bundle of joy arrives. The beauty of this variant of bibs is that it can also be used during the teething stage of your little one, making it quite versatile. 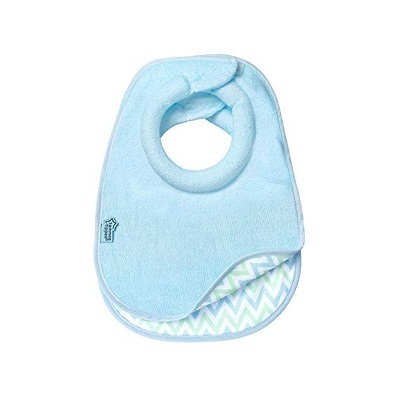 This bib is made with the softest of fabrics for the most sensitive of baby skins. Blended with polyester, these bibs are easy to wash and are quite durable. These protective bibs also ensure that no spit or food gets between the creases of the baby’s neck. Sturdy, lightweight and easy to maintain. Designs can be reversed to make this an appealing accessory. Soft Velcro that makes it milder for the baby’s skin. Tends to shrink a bit after regular use. Velcro tends to fall flat after prolonged use. Does not always sit flat. This bib is two designs in one, padded, and light to the touch. This is our only pick paying homage to the classic variant of the bib for baby. Being a classic, these bibs can easily be custom made for the more creative of parents. 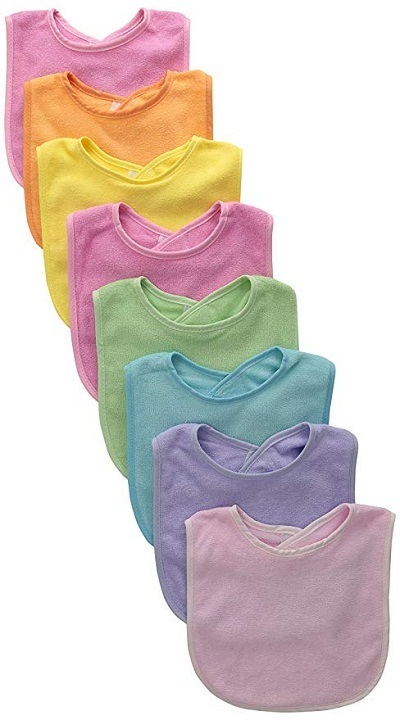 The cotton and polyester blended bibs are double sided, machine washable, and dryer-friendly. Toxic-free materials make this variant user-friendly and an ideal gift. An excellent choice to soak drool, spit and bits of food. Can be embroidered and customized according to choice. Doesn’t keep the clothes as dry. Can be easily tugged off by kids. Rough Velcro that tends to snag. These bibs are simple and classic. You can even customize these basic bibs and add them to your baby’s scrapbook later! This variant of infant bibs is super-absorbent. Invest in these master soaking bibs that come with multiple snap buttons that are entirely free of nickel. These bibs are soft to the touch, easy to wash, and big. This bib is ready for heavy-duty soaking for your champion spitter, teether or simply fussy-eater. Padded bibs with attractive prints. Sits flat and is hard for children to open. Blended with fleece for extra comfort. These bibs are large, soft and have nickel-free buttons. This particular entry is our pick exclusively for bibs for toddlers. They are a slight variation from the usual spitting and soaking affair. However, they are instrumental in keeping the little ones snug and dry. Made with nylon, this bib is durable and easy to maintain. One of the best features of this bib is that it comes with suspenders that can be comfortably adjusted. Lightweight and perfectly fitted with gussets, it’s a must-have for kids who are ready to brave the snow! 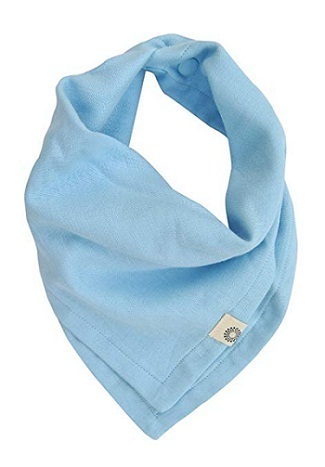 Keeps moisture out and provides easy inner breathing. Stylish outer shell that resists water and wind. Pockets might be a problem. Straps could be problematic if the kids fuss with them. These bibs come with suspenders and gussets to keep them in place. Finally, let’s round off the list with some good old fashioned 100% cotton muslin bibs for children. These are light, trendy, and suit sunny places very well. These bibs are uniquely designed that can be used as a stylish scarf as well. Another versatile feature of this product is that you can unfold these bibs to use as an effective wipe. Reversible design makes it even more appealing. Soft and easy to wash, dry and maintain. Versatile design for different functions. May come across as too thin. Needs to be regularly changed and cleaned. Multiple washes may fade the neutral colors. The bibs are quick drying, come in neutral tones, and are easy to change. Call it a requirement or a trend; it is never too late to invest in some good bibs for all the baby’s growth phases – from newborn to toddler. It is of essential to ensure that bibs serve their general purpose, are easy to store and maintain and are also cost-effective. Above all, remember that comfort is the keyword for bibs. Comfy baby equals a happy baby, which means peace for you!